Thinking about doing an LL.M. in Banking or Finance Law? Many are, since the world’s banking, finance, and securities sectors—not to mention related industries—are huge, highly regulated, and constantly evolving. Because of the size and dynamic nature of these industries, the laws that govern them are often highly complex, which means that lawyers skilled in these areas can be in high demand. That's why the best Banking & Finance LL.M.s leverage up-to-date research in the fields, which may be produced by research centers that are hosted by law schools. These LL.M. programs will cover a range of financial topics, ranging from financial law to corporate law, and may address issues like central banks, mergers and acquisitions, and bankruptcy, among others. Some programs may also delve into subjects like corporate finance, international banking, and economics. An LL.M. program in Banking/Finance/Securities Law can prepare grads for a variety of positions in the financial sector: some LL.M.s go on to work for law firms representing financial services companies; others go on to help individuals or corporations navigate the complex web of contracts and regulations. Additionally, an LL.M. in Banking or Finance can help for those looking to land a job as in-house counsel at a bank or another financial services firm, or even in a regulatory body. See the top 10 Banking & Finance LL.M. programs below. In 2011, the school’s Center on Global Legal Transformation launched the unique Global Finance and Law Initiative, which has produced a range of research looking at the ramifications of the Global Financial Crisis and how it has affected the legal world. Although the school does not offer a specialized LL.M. in Finance, that hasn’t dissuaded graduate from pursuing careers the field: according to research done by LLM GUIDE, the school has the most LL.M. alumni working in the Banking/Finance/Securities Law fields at top law firms of any school surveyed. NYU Law’s Center for Financial Institutions studies is perhaps the world’s foremost research study looking at central banks. The school’s proximity to Wall Street puts LL.M. students within reach of some of the world’s largest financial firms. Although the school does not offer a specialized LL.M. in Finance / Banking Law, students can choose from a range of relevant courses. Some finance-minded students opt to pursue the school's LL.M. in Corporation Law. The school’s Law and Financial Markets Project puts on events and publishes a range of research in financial law and regulation. Students interested in the field can pursue LSE’s LL.M. in Banking Law and Financial Regulation and take advantage of its London location. According to research done by LLM GUIDE, of all the UK law schools, LSE has the most LL.M. grads working in Banking/Finance/Securities Law at top law firms. Harvard Law faculty members have done a substantial amount of research in the area of finance law. The school’s Program on International Financial Systems, founded in 1986, looks at various topics in the field, including international finance, capital markets, financial regulation. Students interested in finance law can pursue Harvard’s LL.M. concentration in Corporate Law, Finance and Governance. KCL’s International Finance Law LL.M. program examines various topics in global financial markets. The school’s faculty publish substantial research in finance law, and KCL’s London location puts LL.M. students right at the heart of one of the world’s biggest financial centers. Germany’s Institute for Law and Finance, established in 2002 by Goethe University Frankfurt am Main, publishes relevant research and puts on various events. It also runs an LL.M. Finance program, during which students can get hands-on experience during an internship. The school’s Frankfurt location means that LL.M. students can study in one of Europe’s biggest financial centers. Home to organizations like the Securities and Exchange Commission and the Financial Industry Regulatory Authority Washington, Washington DC is an ideal destination for LL.M. students who are interested in studying the interface between finance and regulatory policy. 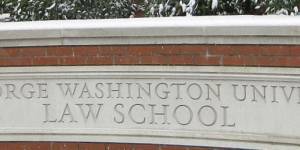 Washington, DC is also home to George Washington University Law School, which offers an LL.M. in Business and Finance Law. The LL.M. leverages insights from the George Washington’s Center for Law, Economics & Finance think tank. BU’s LL.M. in Banking and Financial Law prepares students for the complex needs of financial services clients. Beyond an array of relevant curriculum, the LL.M. also offers students to get hands-on experience through an internship with a financial institution, law firm, government agency, or nonprofit. BU also hosts the Center for Finance, Law & Policy, which publishes relevant research and puts on events. NUS’ LL.M. in Corporate & Financial Services Law allows students to study finance law in one of Asia’s biggest financial centers. The school also sports a specialized research hub—the Centre for Banking & Finance Law—which was launched in 2014. Although not an LL.M. in name, Oxford’s MSc in Law and Finance (MLF) addresses many of the same topics that an LL.M. in Banking or Finance would cover. The program is offered jointly between Oxford’s Faculty of Law and the Saïd Business School, which means that students are exposed to insights from multiple disciplines. Some MLF grads go on to careers as lawyers in law firms, some end up working in investment banks and others become entrepreneurs. Can specialized programs help lawyers seeking to work in one of the hottest fields of law? LLM in London: QMUL / KCL / UCL / City / ? LLM in London: QMUL / KCL / UCL / City / ? To read about rankings, see LLM GUIDE's Law School Rankings page.